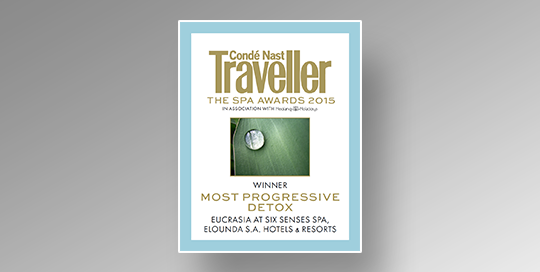 The sector of Health Tourism and the field of Innovation and International Entrepreneurship has earned Greece an exceptional distinction, with the company Eucrasia, in cooperation with the Six Senses Spa Greece and of Elounda SA Hotels & Resorts, having ranked first among the world’s leading companies at the Conde Nast Traveller Awards 2015 in the category “Most Progressive Detox”. The award was received on 03.02.2015 in London by Eucrasia founders, Mr. George Leon and Mr. Klimis Asikoglou and, on behalf of Elounda SA Hotels & Resorts, by Mr. Elias Kokotos. 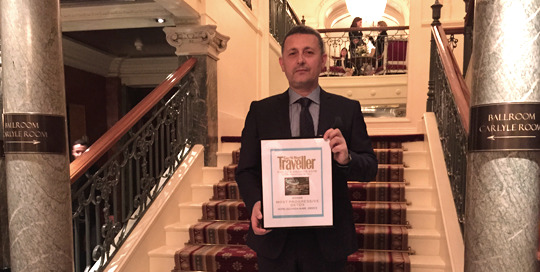 The competition of the prestigious international tourist operator Conde Nast Traveller is an established institution in the field of Tourism and this year, for the first time, honoured a Greek innovative company in the field of Health Tourism with such a distinction. With this international recognition, Eucrasia comes to fuel the contemporary Greek tourist product, aimed at attracting up-market visitors seeking a return to the roots of ancient theories and ways of life that encapsulate essential living.